Happy First Day Of Fall! This time of year always reminds me of apple picking. I’m not much of a baker but, around this time a year I like to make this apple cobbler. The recipe was handed down to me by a family member. It’s very simple to make. Place apples in a 1 1/2 quart baking dish. 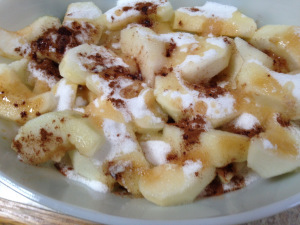 Sprinkle with 1 cup sugar, cinnamon, vanilla extract and dot with 2 teaspoons of melted butter. 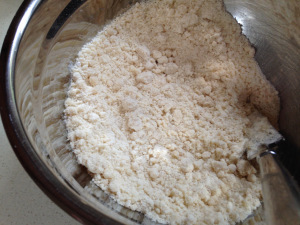 Combine flour, baking powder, 1/3 cup of sugar and salt in mixing bowl. 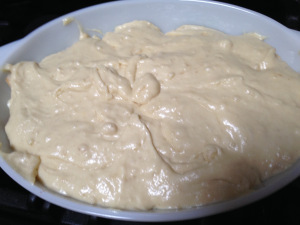 Add 1/4 cup melted butter and mix with fork till mixture is slightly coarser than cornmeal. Combine egg and milk and pour into the dry ingredients. I am now following your blog and would like to know if you may be interested to be a Guest poster with us, and share some of your awesome recipes on our blog?